I have been meaning to read, well, ANY book by Gail Carson Levine, because I've heard great things about them. And I really liked the movie Ella Enchanted. This book is MG, so it's aimed at a slightly younger group than what I usually read. And it was so sweet! Really, this is such a sweet, endearing read. It took me back to the days when I wanted to be friends with a dragon and go on quests involving castles. Oh, who am I kidding, I still would love to do just that! Elodie is a sweet girl, wanting to make a living as a 'mansioner', which is the same as acting I believe, instead of the weaving carreer her parents had pictured for her. 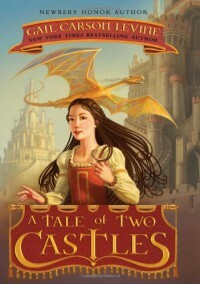 She leaves home and travels to the big city, with two castles. In one lives an ogre and in the other the king and princess. Elodie befriends the dragon who also lives in the city and becomes IT's apprentice. Yes, IT, because only a dragon ITself knows IT's gender. Actually, I was a bit annoyed by the constant use of IT (all in capitals all the time). And I'm still wondering whether the dragon was a male of female. I did love the whole deducing and inducing thing the dragon had, IT also solved mysteries. The whole town was filled with cats because people are afraid of the ogre. And guess what? If cats concentrate in groups on an ogre, he or she can't help but turn into a mouse. I mean, how cool is that for an ogre characteristic? I thought it was totally original! In this case, the ogre was extremely friendly, so I was all for him not turning into a mouse, but still. I did like this book, but I think I would have loved it more if I'd been younger. I do think it's a wonderful children's book and though I figured out who was behind it all, I thought it was really clever.